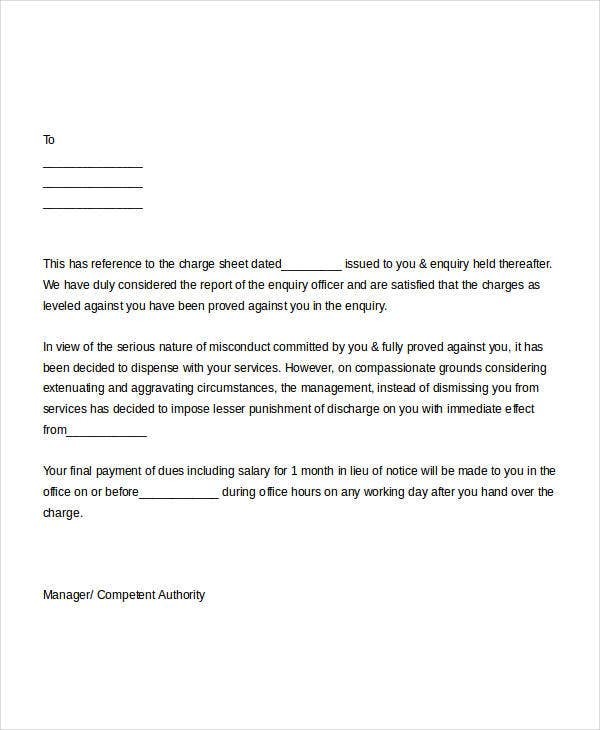 In the world of business, we encounter many situations like promotions, raises, and different company activities; but there also comes a time when we experience terminating employees for various reasons. You may terminate an employee for health reasons when he or she can no longer work properly. Termination is also a possibility because of poor work performance. 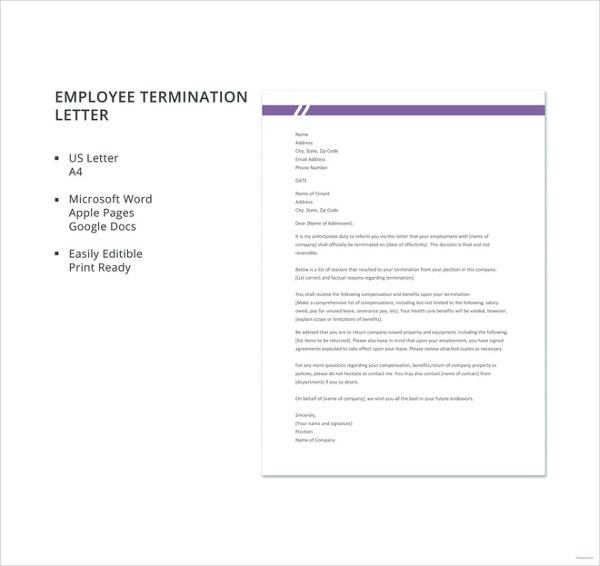 Here, we share some termination letter templates in Microsoft Word formats to hep you create your own termination letter or use as a template as your own and avoid the hassle of formulating a new one. We also share a brief description for some templates on where these types of templates can be used. 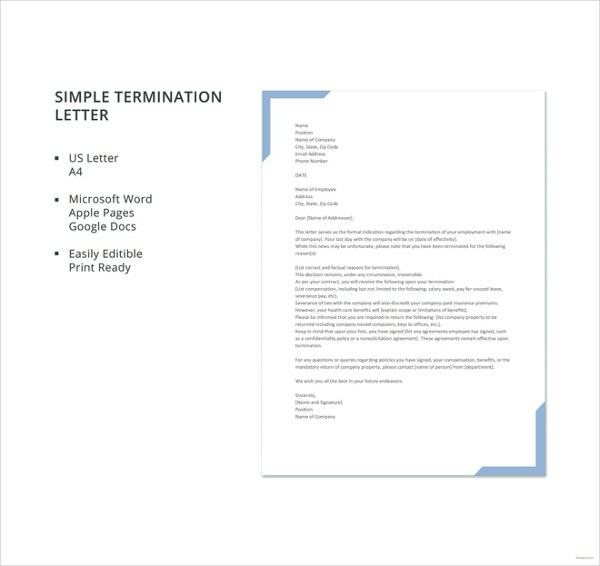 You can also check out our website for more templates and information for more simple termination letter templates. 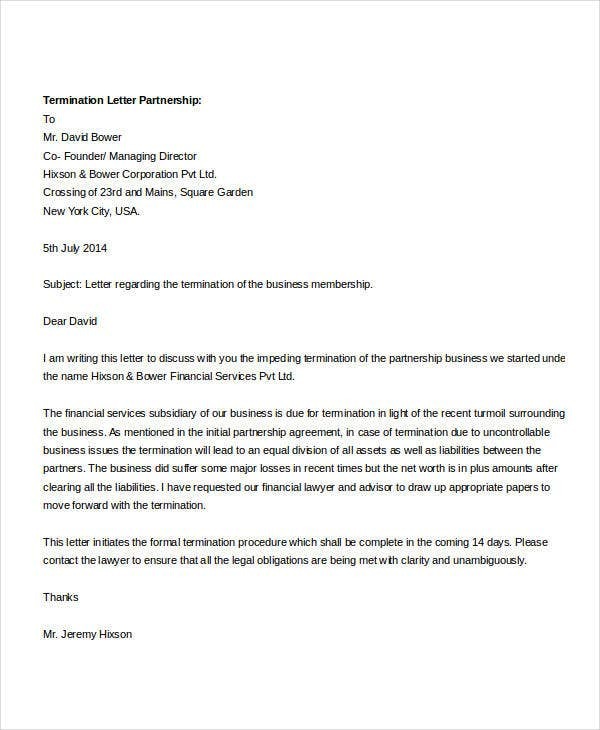 A termination letter is a formal way of informing someone about the termination of a specific employment or lease of a material or place. 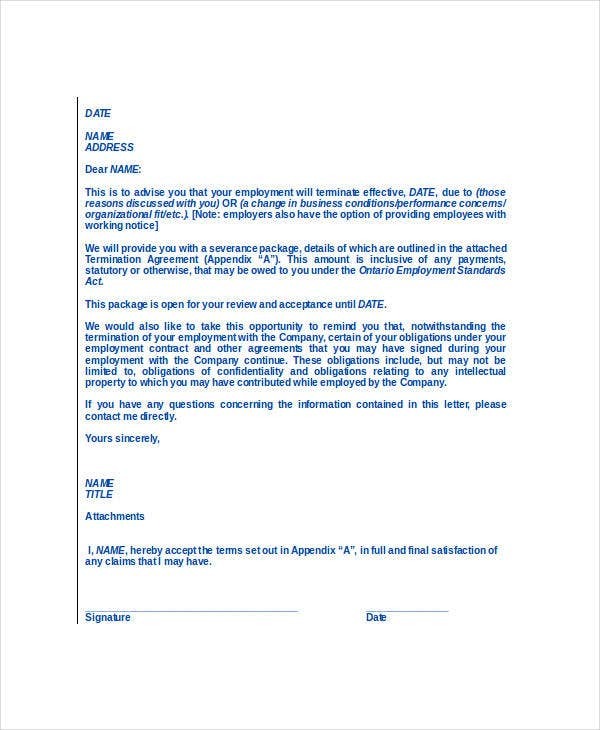 Commonly, termination letters are printed out and placed in an envelope for full confidentiality purposes. 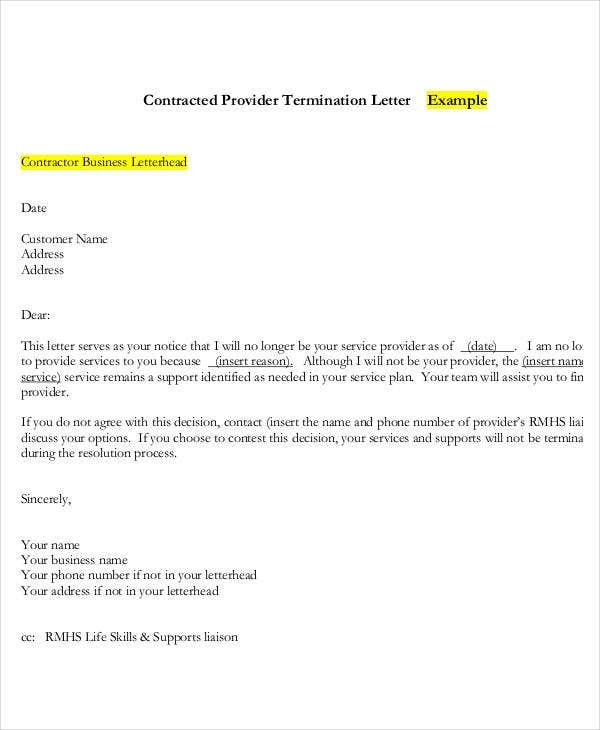 Though there are different kinds of termination letters, they all have the common purpose of ending a certain relation to a job or possession or lease of material. 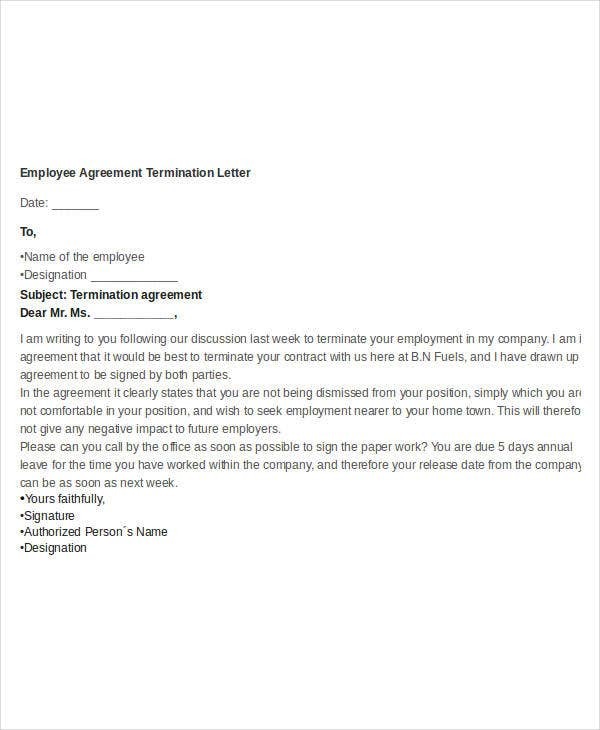 When giving termination letters, you should always have a signed copy for yourself. This is for documentation purposes and can be used as evidence if you need to take matters in your own hands. It is also important to place in as much information as possible to avoid confusion and make everything clear to the other party on the termination they are receiving. 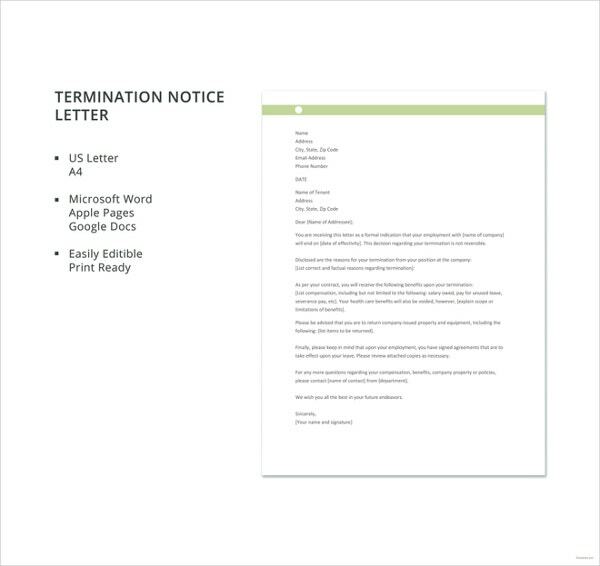 Why Is a Termination Letter Important? 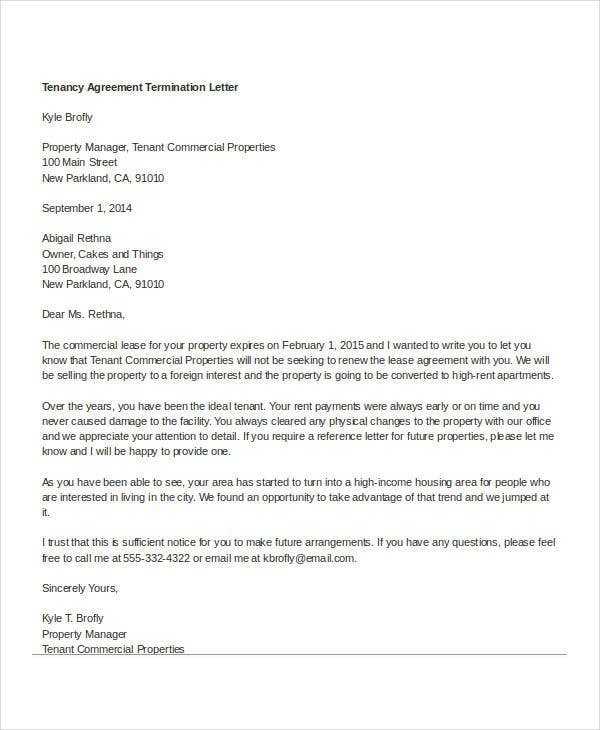 Termination letters are important because they give the other party the information they need if they are being relieved of ownership over certain materials, subscriptions, piece of land, or rent. 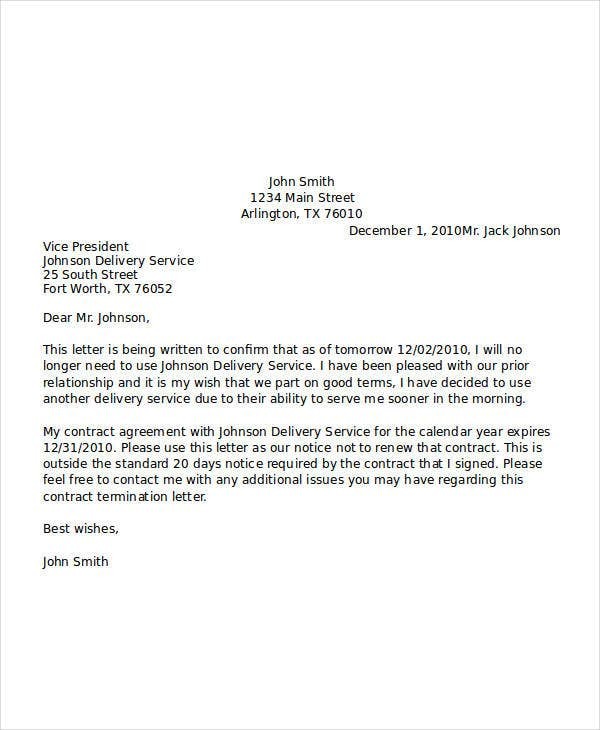 Termination letters can also be used for documentation purposes and is also a formal way of handling out termination reasons to the other party as well. 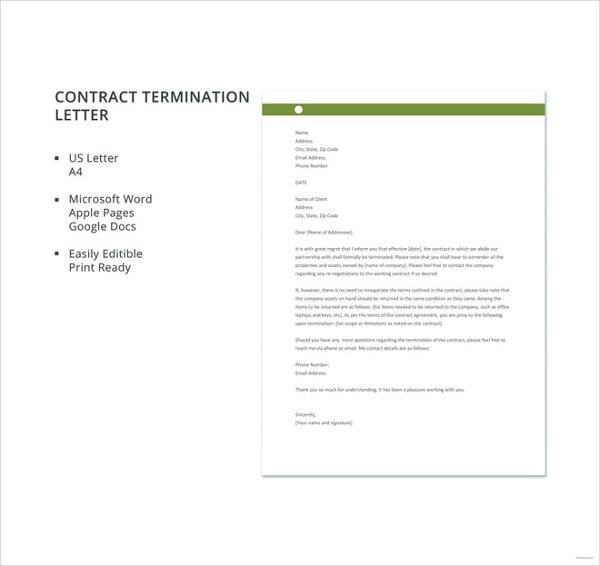 There are different kinds of termination letters you can use for different purposes. 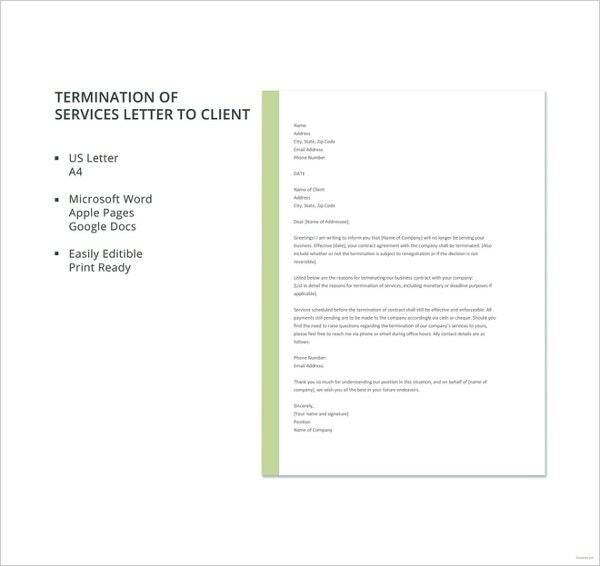 Below are some examples of termination letter templates you can use to serve as a guide in making your own or use the templates right away. 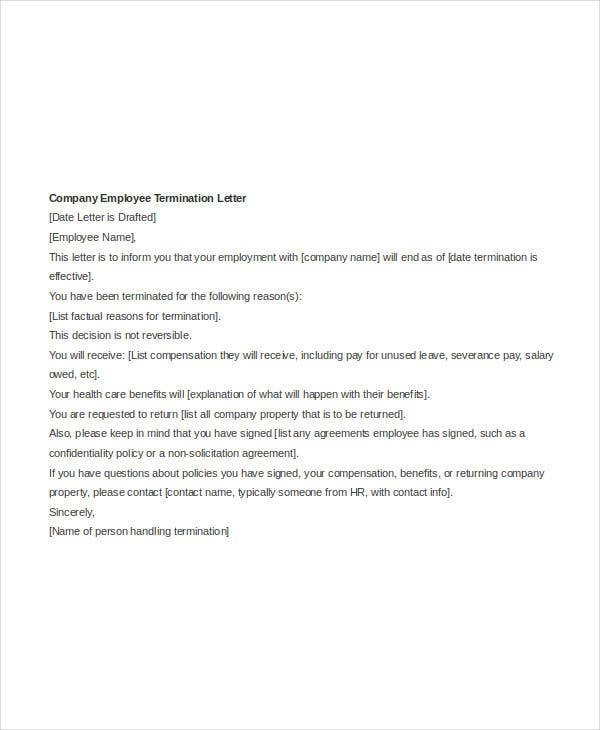 Employee Termination Letter – You can use this template when you want to create a termination letter for your employee to end his or her services to your company. Commonly, they contain when their last day of work will be and when their pay will be given. 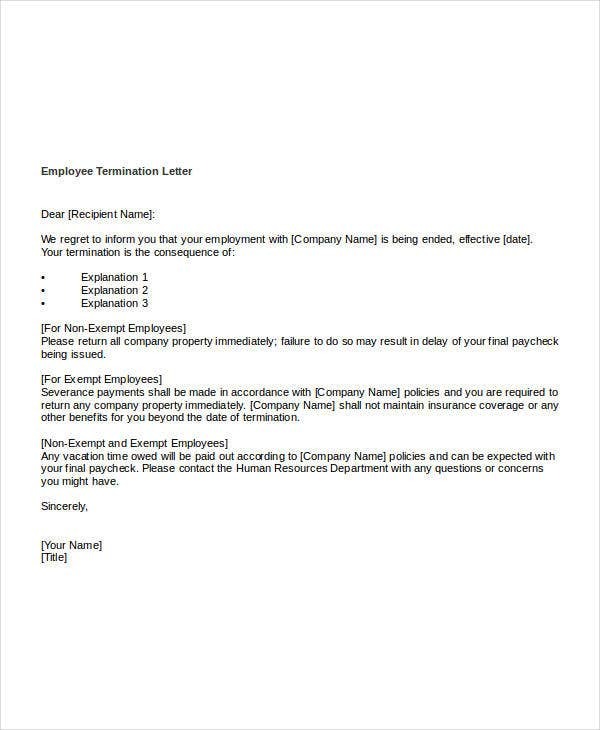 With this template, you can alter the dates and the names when you plan to formally submit your termination letter. 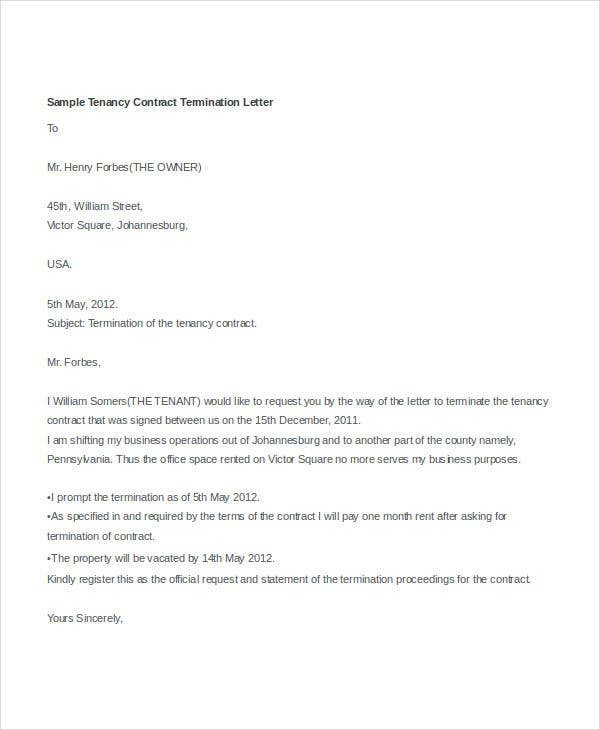 Contract Termination Letter – This type of termination letter is commonly used when ending ownership over a certain material, subscription, or land. 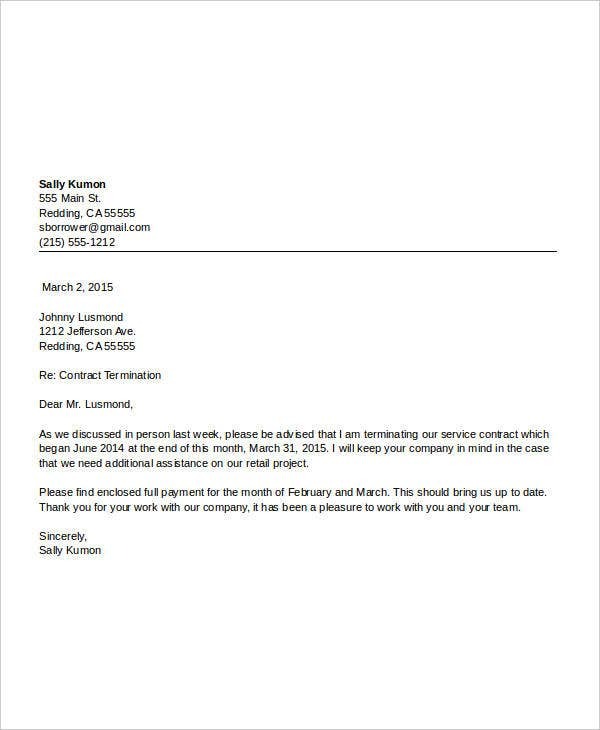 The usual details for this template include the date, the last day where you can surrender such materials, or inform you when your subscription expires. 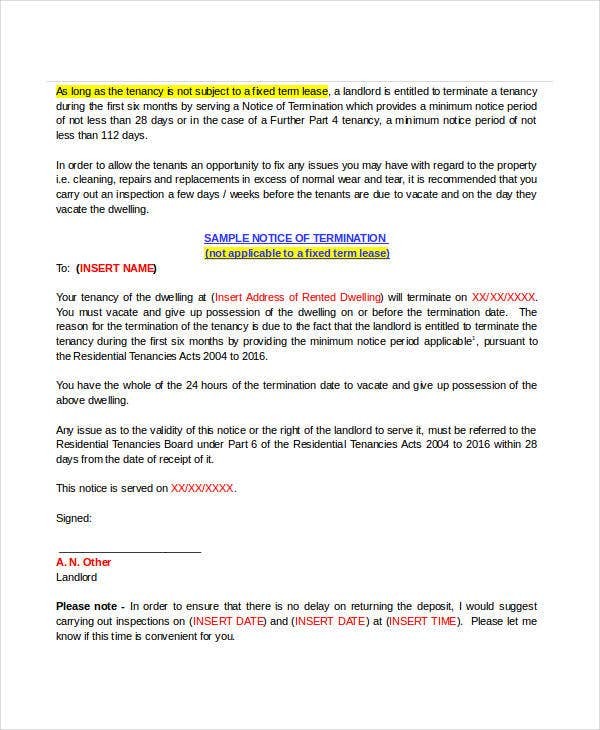 Tenancy Termination Letter – This type of termination letter is used when ending a contract for ownership of certain land or property. Information may also include the date of termination of property and dates for your final inspection of the place. Other information may also contain disclaimers on what the landlord or owner can do in different situations. 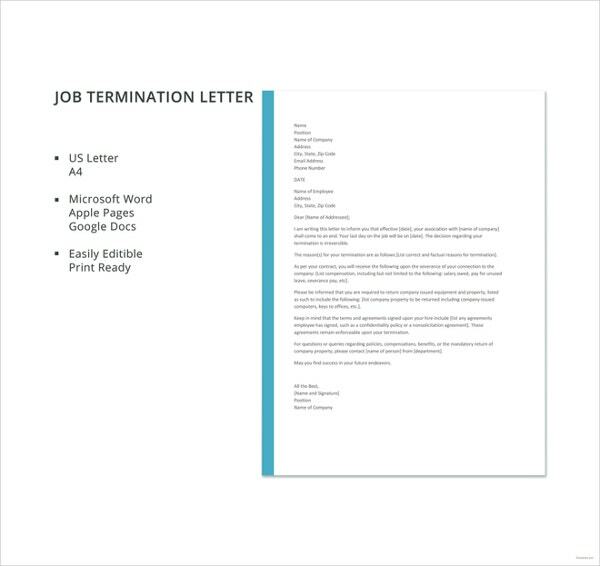 Job Termination Letter – You can use this termination letter template when you want to terminate an employee from his or her job. 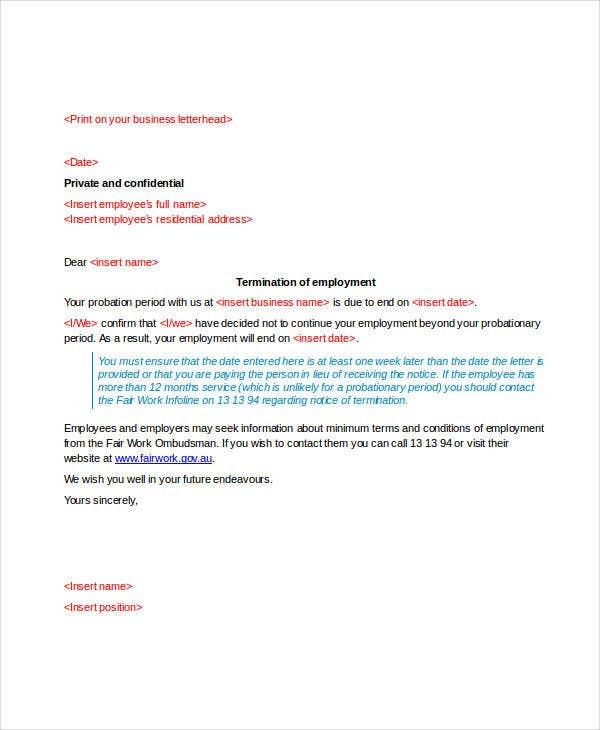 The content this type of template may contain include thee reason for termination, information on what the employer can do in different situations, company contact details if the employee needs to contact the company for any other inquiries, and the final date for the employee to report for work. 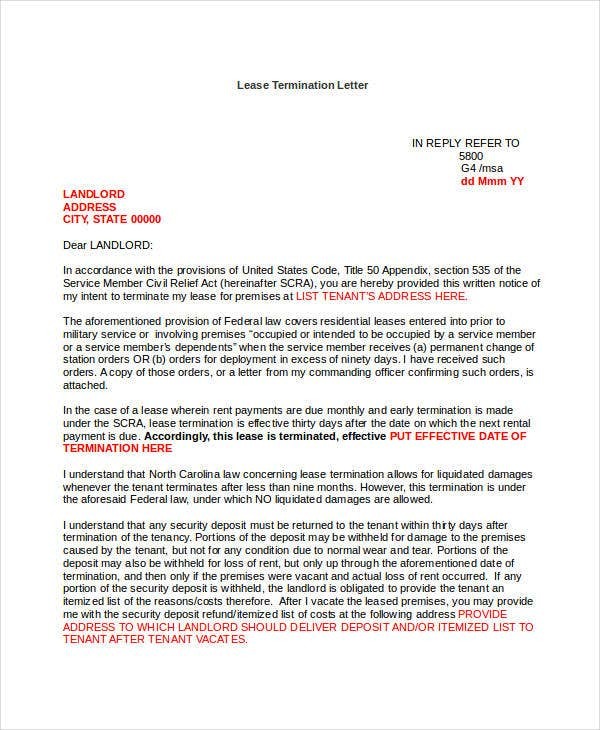 Lease Termination Letter – This type of termination letter template is commonly used when specifically terminating someone’s ownership of a land or space. This is commonly used for people renting apartments, small spaces, or dormitories. 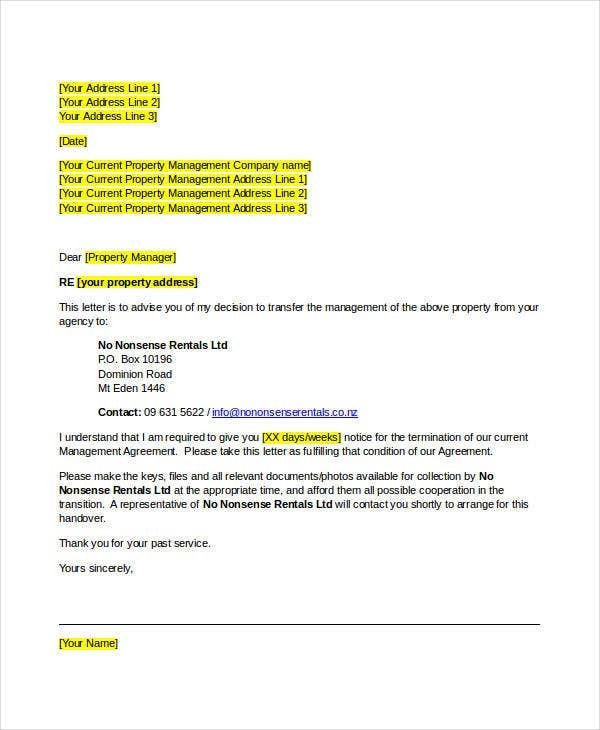 The details that may contain in this type of template may include the effective date of termination, landlord’s contact details, the tenant’s contact details, and information on when the termination will take place as well. 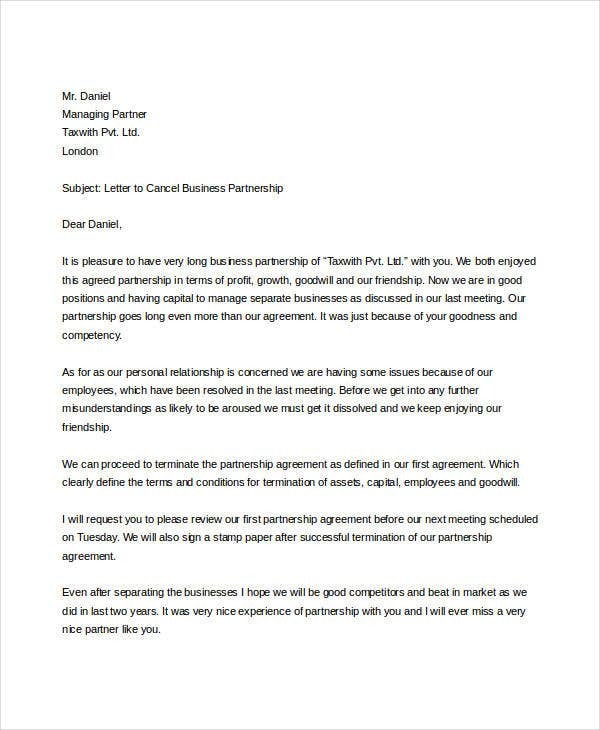 Partnership Termination Letter – This termination letter is used to end a partnership in business with the other party. 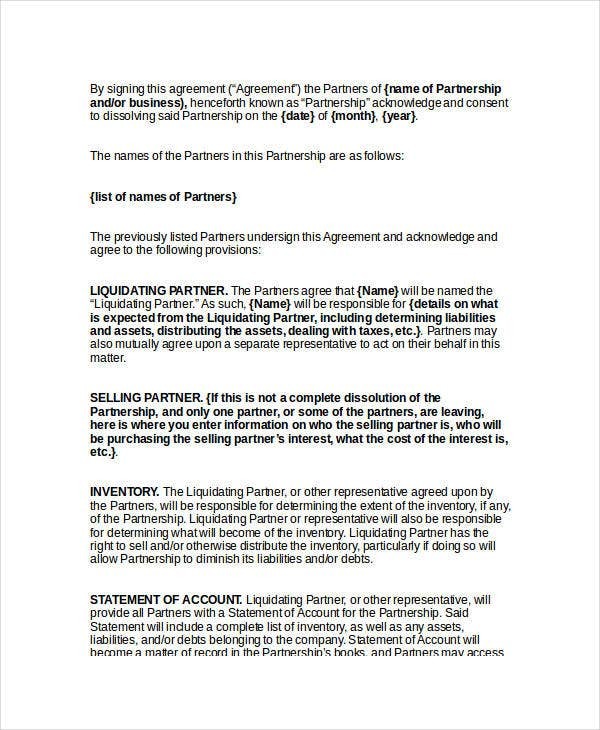 The details that may contain in a partnership termination letter will include the names of the business partners with whom you wish to end your contract, reasons for termination, and contact details. Termination letters will contain very sensitive information which you and the other party may only see. You should also be able to include every detail of the termination you will be making to the other party for them to understand clearly the information why they are being terminated as well. 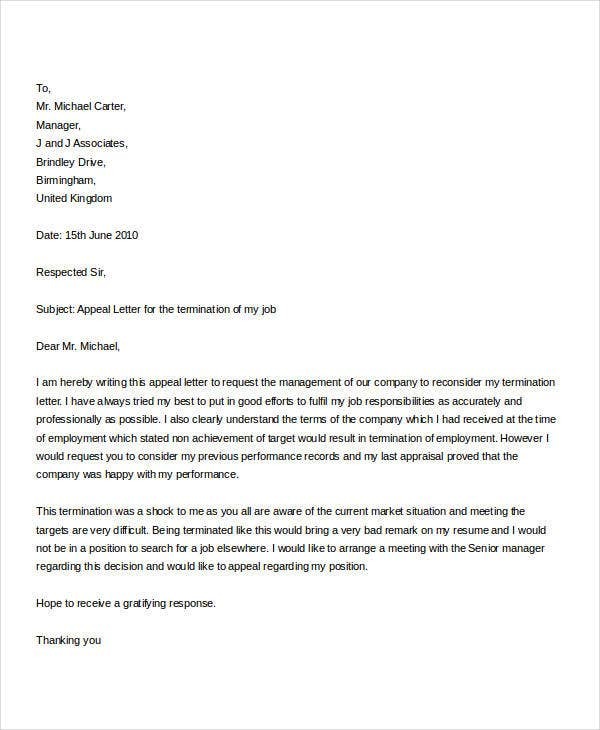 As much as possible, be clear and straightforward with your termination letter. 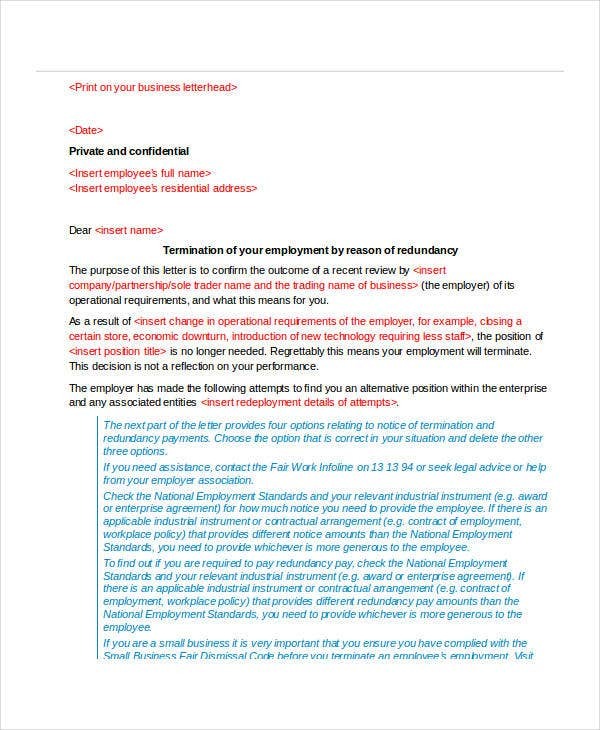 If possible, do not place any informal terms in the terms of termination. You can always check out our website for more sources if you need more templates for different situations. 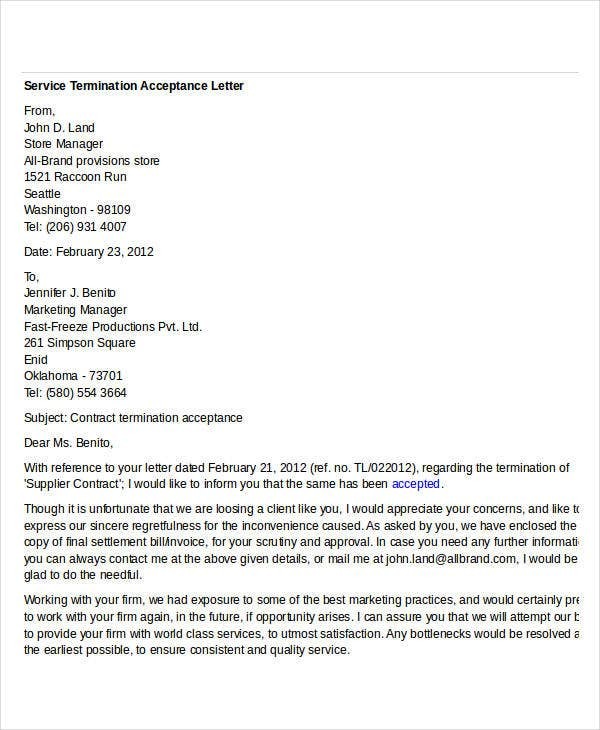 You can also search our website for more sample termination letters and letter of termination templates. 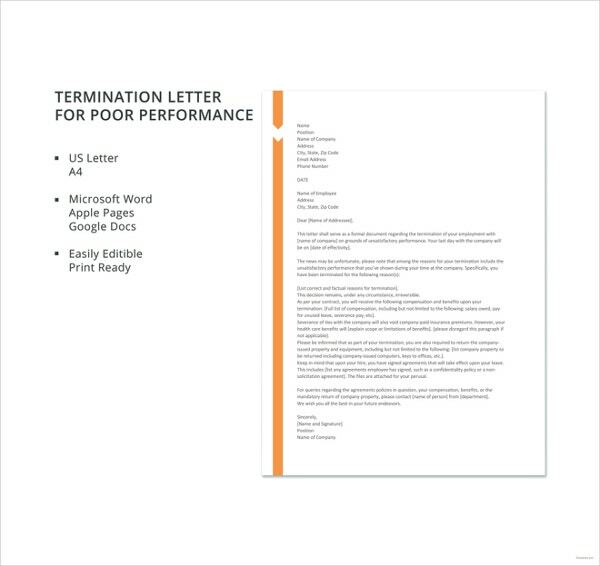 What Should a Termination Letter Contain? 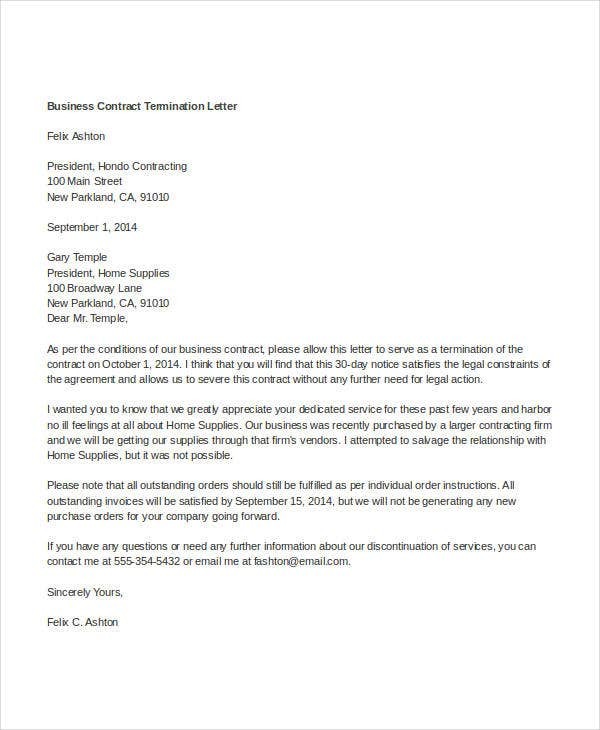 Title – A termination letter should contain a title to formally introduce your termination letter to the reader. Being able to have a title in your letter will give a heads-up to your reader on what they will be reading about as well. 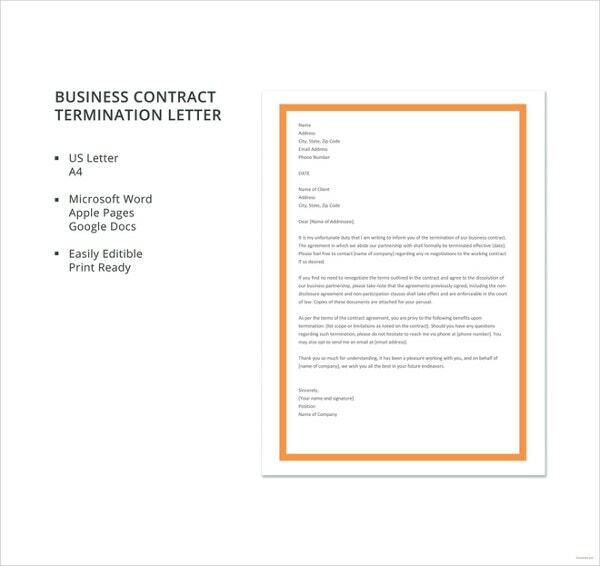 Content – Your termination letter should contain the details like the reason for termination, which is one of the most needed parts in this letter. You will also need to include the date of termination and other information like guidelines to follow before and after the effective date of the termination to inform the other party on what to prepare and give management. Your content will also need to contain a formal greeting and a closing in your letter. Contact Details – You will also need to include your contact details in the main heading of your letter which will also serve as a return address for the post office to use in case your letter doesn’t reach the other person. Placing your contact details will also help the addressee contact you for any questions or concerns about their termination papers. Other Party’s Contact Details – You will also have to place the other party’s contact details at the inside address section of your letter to know for whom the letter will be and for sending purposes. This is also included for formality as well. 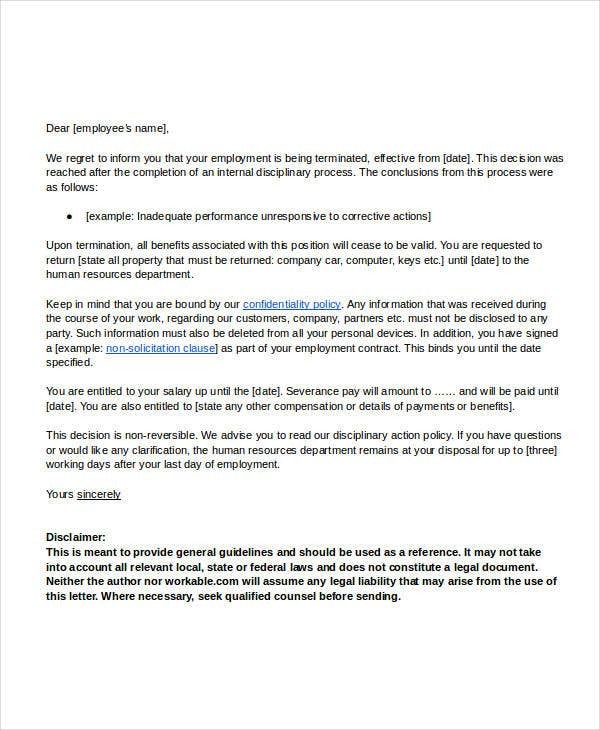 You can also check out our website for more contract termination letters and employee termination letters. Mail – One of the most common methods used to send any letter is through mail. This is advisable to use if you do not have access to the Internet or if the person you wish to send your letter to does not have access to email or the Internet as well. Be advised that you will have to take note of the different shipping schedules your post office may have if you do not want to have any delays with delivering your mail. Personally – The most formal way of being able to give your termination letter to the other person is through giving it personally. Being able to give your letters personally will make it feel more urgent and personal instead of sending them through mail. Giving your termination letters personally will also benefit the other person where he or she can ask questions or have other inquiries on the spot as well. Email – Another method for sending your termination letters is through email. Using emails to send your work will give you the advantage of being able to send your work quickly and for your contacts to receive them right away as well. Sending your letters through email is also another advantage as most people today use emails to check for any new mails and is also a common way of communicating as well. 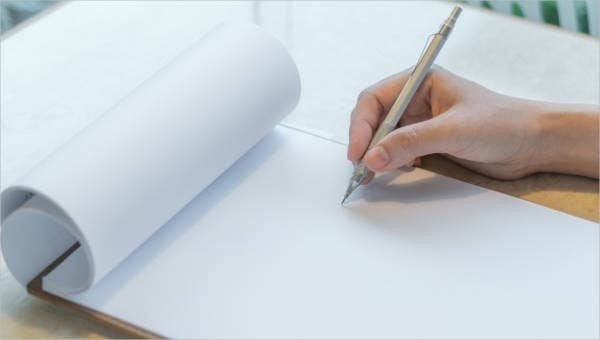 Though there are different methods of sending your termination letters, it is really best to be able to give them personally for formality purposes, which is also preferable because termination letters contain very sensitive and confidential information in which you and the other person should only know. 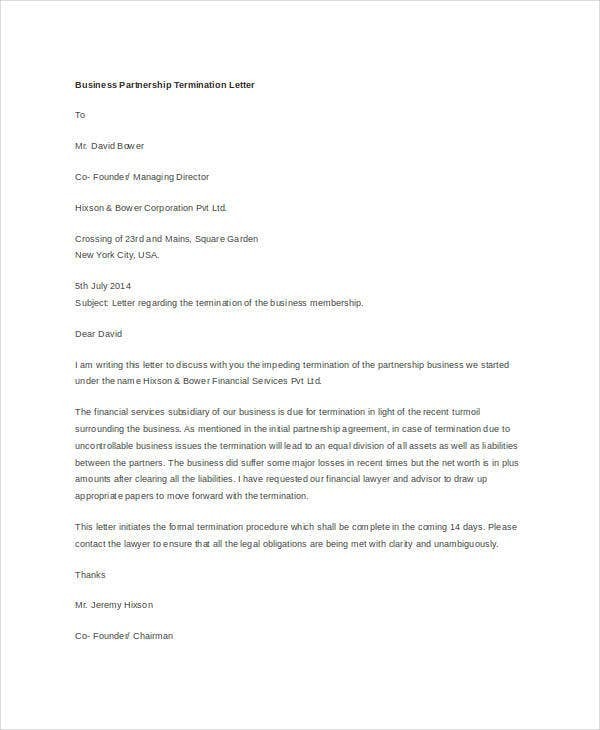 If you need more help with looking for more termination letter templates to use in making your own letters, you can visit our website as we can provide different templates and information for different topics which may prove useful for your future projects. 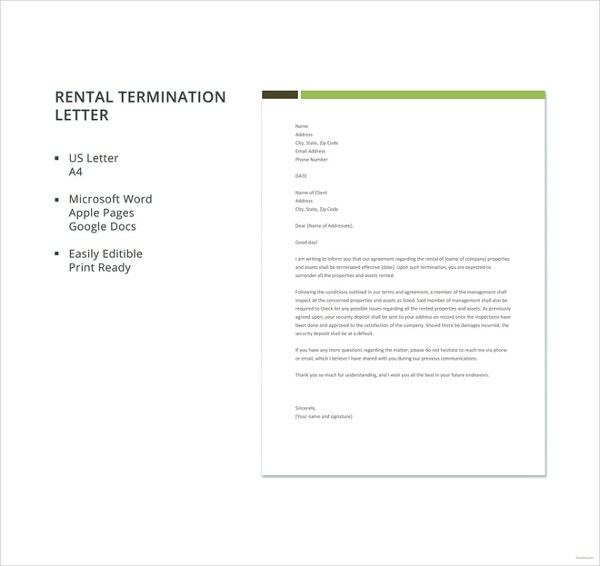 You can also download and use more termination letters and lease termination letters.